A new study led by the U.S. Geological Survey (USGS) and the University of Wyoming found that increased westward ice drift in the Beaufort and Chukchi seas requires polar bears to expend more energy walking eastward on a faster-moving “treadmill” of sea ice. These findings represent the first assessment of the consequences of changing drift rates for polar bears, one of several previously unexplored effects of sea ice loss. The results were derived from radio-tracking data of collared adult female polar bears in the Beaufort and Chukchi seas, coupled with sea ice drift data from the National Snow and Ice Data Center (NSIDC). The data, composed of over 77,000 bear locations and matching ice drift values, were collected during two periods with different sea ice characteristics, 1987-98 and 1999-2013. The study estimates that polar bears must catch and consume one to three more seals per year (a 2-6 percent increase) in order to compensate for the higher expenditure of living on faster-drifting ice. This elevated energy expenditure is concurrent with a diminished availability of sea ice suitable for hunting seals, due to early ice melt in spring and expansive ice melt during summer. The need to travel longer distances coincides with deterioration of the ice surface, on which polar bears walk, creating a complex and difficult environment to traverse. The study showed that, during the recent period, a solitary adult female polar bear required between 2.8 million and 3.2 million kilocalories annually. This was 51,000-107,000 kilocalories more than during the early period and is 3.5-4 times greater than total energy requirements of a moderately active adult human female. The paper, titled “Increased Arctic sea ice drift alters polar bear movements and energetics,” is published today (June 5) in the journal Global Change Biology. Partners in the research included the U.S. 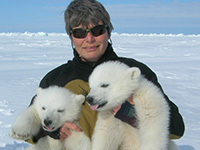 Fish and Wildlife Service, Environment and Climate Change Canada, and Polar Bears International.